Microfiber is environmentally safe and hypoallergenic. It is mechanically split without the use of additives, chemicals, or boiling; ensuring that Spotless Paw® products are safe for both you and your pet. I recently bought a few Spotless Paws and gave two away as gifts; one to my aunt who has a white german shepherd and one to my future brother-in-law who just got a lab/mastiff mix pup. My aunt told me she just loves the Paw! Her shepherd is addicted to mud, and the glove makes cleaning easier & quicker, plus the dog enjoys it more. My brother-in-law said his pup actually looks forward to the Spotless Paw and wiggles all over in anticipation. They are both thrilled and very grateful. Thanks so much for making such a terrific product!! We love our Spotless Paw! I can't believe how quickly and easily it cleans my dog, Anni's paws. I LOVE my Spotless Paw! My good friend gave me two Spotless Paw gloves for my birthday this past weekend and I love it! I have three large mixed breeds (all over 70 pounds) and every spring we go through the torture of dipping paws into bowls of water and wet towels everywhere. Not any more! I don't have to get upset about cleaning them off after a romp through the mud - this glove is wonderful! Can I tell you that we think it is just about the greatest thing invented?! We have 3 large dogs, and in the spring our backyard turns into a muddy mess. We went through many towels wiping dogs feet, but no longer. Spotless Paw is an amazing product and we have told our friends with dogs about it also. Thank the inventor for us! I hired a dog trainer to come to my house to help me train my 8 month old Lab puppy. As a gift, he gave me your glove. It is the greatest thing I have ever used. This is why I purchased 3 more for family and friends. The glove arrived Saturday afternoon. I didn't see it until Sunday morning however. Sailor, my youngest Golden Retriever had been out 'excavating' in the backyard and when he appeared at the backdoor was MUD from head-to-toe! I thought "Wouldn't it be nice if that glove had arrived yesterday." At the same time I decided to go out and see what had come in Saturday's mail and to my amazement, the box was on my porch with the glove inside! I ripped into it like a kid on Christmas morning and cleaned my baby golden in just minutes. No pail of muddy water, no messy rags to contend with. The glove is incredible and I'm already passing it around to my dog-friends to give a try. So far it's a unanimous "Paws up!" from all of us! I'm even thinking of getting one for drying off the car after I wash it. Congratulations on developing and marketing a USEFUL pet product. Best Wishes for continued success! We love Spotless Paw! Our Aussie runs through snow, rain, and mud and comes back to us covered in filth. Spotless Paw removes the water from his undercoat and the dirt from his paws before he comes into the house. The Paw attaches easily to our belts so we often take it with us when we go to the park or when we take our dog for a hike. Spotless Paw has not failed us yet. -- David S - Hartford, CT.
I’ve been using my Spotless Paw glove on my dog’s dirty paws for months and have not had to wash it yet. What a wonderful product to keep my home clean. Thank you Spotless Paw. 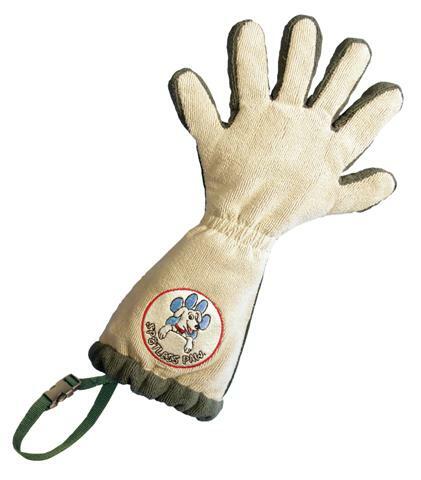 Spotless Paw Dog Paw Cleaning Glove® is washer and dryer safe. When it becomes saturated simply throw it into the washing machine. Do not to use bleach. DO NOT USE FABRIC SOFTENER. Softener clogs the fibers making the glove less effective. Tumble dry on low heat. Do not iron your Spotless Paw®. What is Spotless Paw’s primary use? To clean dirty paws before your pet tracks dirt, mud and water into you home and car. Can Spotless Paw clean other parts of the dog? Yes. In addition to the paws, you can clean the legs, bellies and basically any part of your dog that gets wet or muddy. Why does Spotless Paw have six fingers? So that it can be worn on either hand on either side. How many gloves do I need? A single glove works great with one dog or two small to medium size dogs. If you have two or more large dogs, you will need a couple of gloves. People also like to keep an extra glove in the car or a spare if one is being washed. How long does Spotless Paw last? Spotless Paw is created to last. We have been using the original prototypes for over a year. How do you clean Spotless Paw? Spotless Paw is machine washable and dryable. Please do not use fabric softener because that renders the microfiber less effective. How many times can the glove be used between washings? This depends upon how often the glove is used. Some customers have used their glove for months without having to wash it. It dries very quickly because of the large surface area of the microfiber fabric. What makes this glove better than a regular towel? a. Spotless Paw conveniently hangs on a door handle instead of sitting in a wet mess on the floor. It is always there when you need it. b. The microfiber fabric absorbs over 600% of its weight in dirt, mud and water. c. The fingers allow you to clean between the dog’s toes and under the nails to completely clean the paws. This is not possible with a towel. d. The glove is less threatening to a dog than a towel; it looks like your hand. e. You have more control to clean the paws of a smaller dog and therefore will not hurt a little paw. Can Spotless Paw be used on other animals? Yes. People use Spotless Paw to clean their cats, horses, ferrets and even pet pigs. How much can the glove hold? Spotless Paw absorbs over 600% of its weight in dirt, mud and water. What can Spotless Paw clean? Can it clean clay? Spotless Paw cleans and dries clay, dirt, mud, water, road salt, feces and anything else that may be on your pet’s paws. Does the glove need to be wet before using it? Spotless Paw works wet or dry. You will be transferred to secure site for credit card processing.